Eid is one of the most important and joyous days in the Islamic calendar. Marking the end of the holy fasting month of Ramadan, Eid al-Fitr is a day of celebration, worship, quality time with the family and delicious food. Depending on the country you live in, the rituals may differ, but one thing that all Muslims will experience wherever they are in the world is a lot of planning. Alongside the food preparations, the decorations and the invites, the most important consideration for the fashion-forward little lady is her outfit. Ramadan is a period of reflection and growth, and Eid marks an opportunity to present your new sense of self. It’s a time to embrace the excitement of the festivities and dress to impress. In this post, we take a look at our favourite party dresses and special occasion dresses that are sure to inspire and delight this Eid. Green has long been a symbolic colour for the Islamic faith. Representing purity, happiness, nature and life, green is found on the flags of most Islamic countries and is said to be the favourite colour of Mohammed himself. Green also falls in the middle of the visible spectrum, and many followers believe this is why green has become synonymous with Islam and its message of moderation. With so much symbolism and meaning behind the colour green, it’s not surprising that green frocks are also a traditional choice for Eid celebrations. Green comes in a variety of shades and hues, so there’s no need to be worried about blending in too much. Our ivory bluebell flower girl gown is a subtle nod towards this heritage and happy colour. With a dainty aesthetic and bearing couture craftsmanship, this delicate gown is sure to make your little girl feel every inch the party princess. The luxury tulle layering and ball gown silhouette combined with the artisan bluebell embroidery make this a stunning option for your young girl. Blue, the colour of the sky and a symbolic colour of eternity, heaven and spirituality, is one of the most versatile and diverse colours around. From sparkling sapphire and rich navy to delicate egg-shell blue, there’s a shade for every taste. For something bold and brilliant, you can’t go wrong with our royal blue floral deluxe dress. Available in a royal blue and ivory colour palette and with a beautiful floral pattern, this luxurious satin showstopper conveys elegance and glamour. Featuring a timeless fit-and-flare silhouette, your little angel will look as fabulous as she feels — it’s a perfect dress for twirling and swirling. For elegant teens, our royal blue floral maxi dress is a lovely choice. Exclusive to David Charles, this modest modern maxi gown is flattering and feminine. With an elasticated cold-shoulder sleeve, soft truffle trim and waist tie detail, this long dress, with its beautiful botanical design, is a real head turner. Eid is a celebration, and no celebration would be the same without some glitter and shine. Embrace the joy of the occasion with a David Charles ivory butterfly Alice band. Tailor-made from flexible silicone and encased within a glamorous grosgrain ribbon, this band references the journey of re-discovery taken through Ramadan. Its molten gold butterfly and leaf design, accented with dazzling diamantés, guarantee a look fit for a princess. For something glamorous and couture, your little angel can’t go wrong with our jewel gold apple clutch bag. 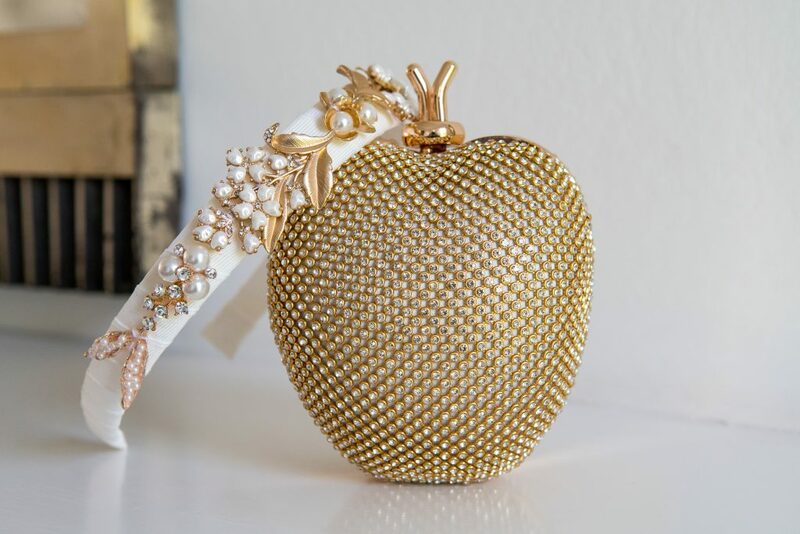 Sparkly, shimmery, shiny and fun, the kitsch apple clutch is perfect for girls looking make an impression on the big day. Browse our full collection of summer/spring dresses and find your little angel the perfect party dress for Eid.